Paul Coffey is one of the most accomplished defensemen to ever take the ice. As a result, Paul Coffey cards and autographed memorabilia are among the most collectible in hockey. His awards, accolades and statistical achievements are clear evidence of his Hall of Fame-worthy career. He is a multi-time Norris Trophy winner as the league's best defenseman. Coffey was also a member of four Stanley Cup-winning teams and a 14-time All-Star. 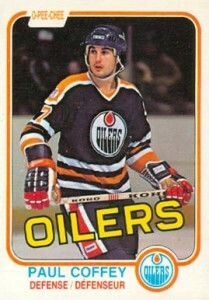 Coffey's rookie card is from the 1981-82 O-Pee-Chee Hockey set. Additionally, the Red Robin restaurant chai, also issued a card of Coffey during the same year. He has no minor league cards. 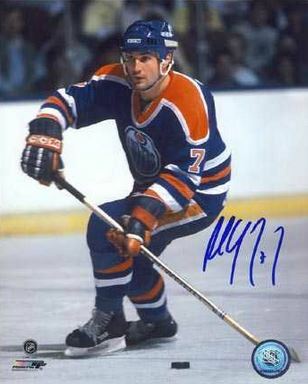 Paul Coffey's first certified autograph cards are from 1997-98 Be A Player. There are three different versions: regular, die-cut and Prismatic die-cut. None of the cards are serial numbered. However, the Prismatic card has a known print run of 100. His first memorabilia cards were issued the following year in 1998-99 Be A Player. The cards contain a swatch of a Paul Coffey game-worn jersey. There were a total of 100 cards produced, however, they are not serial numbered. 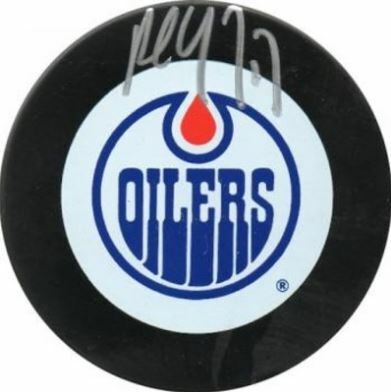 Due to Paul Coffey's lengthy caree, with some high-profile teams, he has an ample amount of autographed memorabilia available in the marketplace. The O-Pee-Chee Hockey sets from the early 1980's are loaded with rookie cards of future Hall of Fame players. Paul Coffey's is one of them. As was common for the era, the most notable condition issues seen with this card are centering, mis-cuts and print dots.It is an iconic piece of cardboard history of one of the game's all-time greatest players. 1990 Score Hockey Paul Coffey #6 Lot Of 5 Penguins, PSA, Clean! Below you will find an example of what Paul Coffey's authentic signature looks like. This can be used as a first point of reference for determining the legitimacy of autograph memorabilia, but is not a substitute for having your items authenticated by a well-respected professional autograph authentication company. Some of the trusted sources within the sports memorabilia market include the following companies: PSA, JSA, Tristar, and Mounted Memories. Click on any of the images below to view full size photos. His most commonly seen signature is an abbreviation of the first and last name. The first name consists of a "P" and "l."
The "P" exhibits a tall, narrow and vertical loop. The last name is abbreviated with a character combination of "CY." 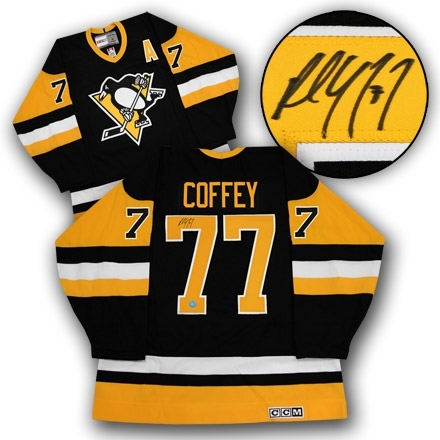 He almost always inscribes his jersey "#77."